Every successful audition often comes after 10 rejections, said the British actress who’s starred in musicals such as The Addams Family Musical and Les Misérables. She’s been turned down at auditions for not having the “right” skin tone, body figure or accent, but British musical actress Carrie Hope Fletcher has learnt to take each rejection in her stride. “Rejection is inevitable,” the 25-year-old told The UrbanWire when she met the press with her co-star Oliver Ormson. 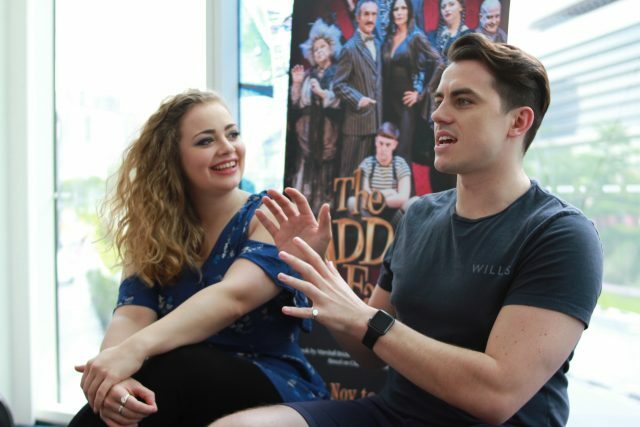 They are in Singapore to perform in the widely acclaimed musical comedy, The Addams Family, a story that centers on an eccentric but endearing family. But Fletcher always keeps herself busy when she’s in between acting gigs. She spends her time creating vlogs and song covers on her YouTube channel, ItsWayPastMyBedTime, and has built a 650,000-strong following. She likes it that she’s able to make her own videos and monetize them without involving a record label or production company. Having the YouTube channel also allows Fletcher to promote The Addams Family to her followers. She’s shared behind-the-scene footage of her rehearsals to generate interest about the show, which is one of the latest iterations of Charles Addams’ well-loved single-panel cartoons from the 1930s. Producers John Stalker and Katy Lipson said they noticed that The Addams Family has very high level of coverage on social media. “People went 10 to 15 times and many were constantly tweeting us about it,” Lipson said. When asked about her future plans after completing the UK tour of The Addams Family, Fletcher was thrilled to share her involvement in Christmasauras, a book-turned-musical written by her brother, Tom Fletcher. She does not have plans for acting in 2018 though. “I’ll be unemployed again,” she said in jest. But she’ll be spending time on writing her novel “When The Curtain Falls”, and as always, she’s got YouTube to keep her busy. The Addams Family is now running at the MES Theatre at Mediacorp until Dec 3. For ticketing details, visit https://www.sistic.com.sg/events/caddams1217.